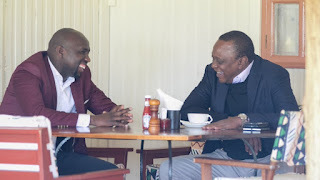 Saturday August 18, 2018 - Elgeyo Marakwet Senator Kipchumba Murkomen has lit up the internet after being treated to niceties by President Uhuru Kenyatta yesterday. Murkomen, who ,has been taunting the President over his handshake with Opposition leader Raila Odinga, the purge on corruption that seems to target Deputy President William Ruto and the recent Mau Forest evictions that is targeting the Kalenjin community, took to his social media to announce that President Uhuru Kenyatta just bought him tea. According to Murkomen, he was just accompanying Uhuru to grace the climax of the Kenya Music Festivals at the Sagana State Lodge when they stopped by an unnamed joint and the Head of State offered to foot the bill of the hot beverage. He thanked Uhuru for the tea and vowed never to antagonize him again. “Ubarikiwe sana Boss!” Murkomen tweeted.